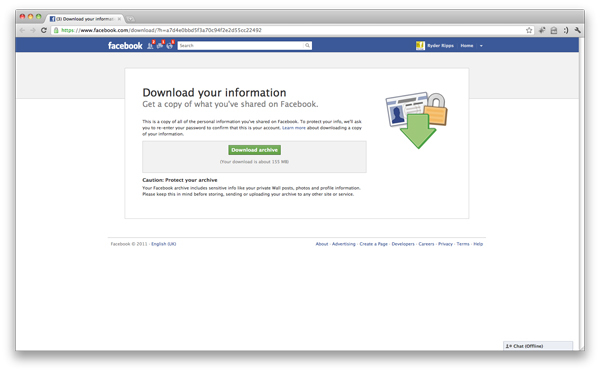 Rhizome | Blog Posts tagged "facebook"
Nora N. Khan | Wed Mar 11th, 2015 10 a.m. I can't always articulate what it is like to be a worker, writhing in muted panic in the net of late capitalism. But I have found a fine outlet in Business Fish, a surreal family of sticker sets on Facebook Messenger, which I use to illustrate many of my exchanges. 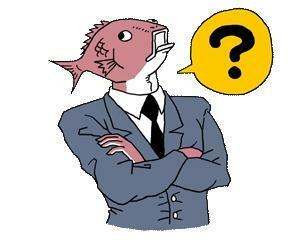 Business Fish has struck a nerve since his introduction last year: he has many vocal fans (3200+ on his Facebook page) and he's been profiled in the mainstream news. Inspired by the Shinto belief that divinity resides in animals, his creator—an artist at Tokyo-based studio Quan, Inc.—gave him a pink fish head capping a human body in a boxy blue suit that, in today's workplace fashion parlance, reads as "male business casual." At first glance, Business Fish seems like a composite of Gordon Gekko and Jordan Belfort, ruthless hunters of success, profit and glamor. Closer examination of his sixteen, hyper-expressive graphics reveals a more complex narrative. He wakes in shock, sweaty, the sun at his head. He gets caught in a subway turnstile. He struggles, briefcase in hand, coughing and shaking, knees buckling. After a setback, he slumps in shame against a wall. He bows, and weeps, and clenches his fists in rage. He grovels on the ground, possibly begging for the privilege of working another day. Created with Japanese office culture in mind, but meant to represent workers worldwide, Business Fish is a pressure-crushed employee, shot through with anxiety and anguish. If strong emotions, particularly dysphoric ones, are "the psychic fuel on which capitalist society runs," Business Fish is a resource burning at both ends. Daniel Rourke | Tue Oct 8th, 2013 10:30 a.m.
Daniel Rourke: Your recent work, You Could've Said, is described as "a Google keyword confessional for radio." I've often considered your work as having elements of the confession, partly because of the deeply personal stance you perform—addressing we, the viewer or listener, in a one-on-one confluence, but also through the way your work hijacks and exposes the unseen, often algorithmic, functions of social and network media. You allow Google keywords to parasitize your identity and in turn you apparently "confess" on Google's behalf. Are you in search of redemption for your social-media self? Or is it the soul of the algorithm you wish to save? Erica Scourti: Or maybe the algorithm and social media soul is now so intertwined and interdependent that it makes little sense to even separate the two, in a unlikely fulfillment of Donna Haraway's cyborg? Instead of having machines built into/onto us (Google glasses notwithstanding), the algorithms which parse our email content, Facebook behaviours, Amazon spending habits, and so on, don't just read us, but shape us. Louis Doulas | Thu Mar 29th, 2012 12:28 p.m.
Diacritics are accent marks used to indicate the type of pronunciation a certain word infers. Diacritics are used in Latin script, but are also specific to other alphabetic systems such as the vowel pointing scripts of the Arabic harakat. 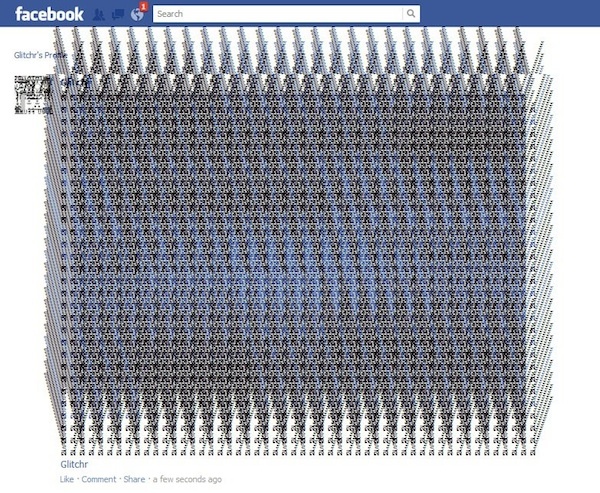 In Laimonas Zakas’ project, Glitchr, a facebook page is dedicated to glitchily deforming the posting interfaces of Facebook. Diacritical marks are emptied from their primary communicative signifiers and repurposed as formalized, aestheticized objects; accomplices in the jailbreaking of Facebook page hegemony. Rather then its users shaping and determining its network, Facebook is known—amongst other things—for creating quite the opposite for users: a loss of control, of malleability and the continued reiteration of a standardized user conduct. Glitchr then, in such a world, becomes a refreshing, if not odd spectacle: gifs become enabled, symbols and text float around up and down the page never adhering to the coded structure within. Though Glitchr to some degree interrupts the normativity of the Facebook structure revealing what one can safetly get away with, its subversive aesthetics survive only as mirage in the desert of the Zuckerberg empire. Rhizome | Thu Dec 22nd, 2011 10:42 a.m.
Bogost threw together a bare-bones Facebook game in three days. The rules were simple to the point of absurdity: There was a picture of a cow, which players were allowed to click once every six hours. Each time they did, they received one point, called a click. Players could invite as many as eight friends to join their “pasture”; whenever anyone within the pasture clicked their cow, they all received a click. A leaderboard tracked the game’s most prodigious clickers. Players could purchase in-game currency, called mooney, which they could use to buy more cows or circumvent the time restriction. In true FarmVille fashion, whenever a player clicked a cow, an announcement—”I’m clicking a cow“—appeared on their Facebook newsfeed. 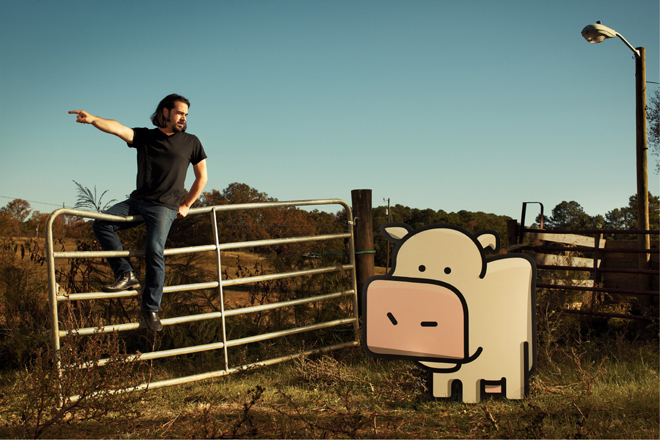 Bogost launched Cow Clicker during the NYU event in July 2010. Within weeks, it had achieved cult status among indie-game fans and social-game critics. Every “I’m clicking a cow” newsfeed update served as a badge of ironic protest. Players gleefully clicked cows to send a message to their FarmVille -loving friends or to identify themselves as members of the anti-Zynga underground. The game began attracting press on sites like TechCrunch and Slashdot. Zoë Salditch | Mon Nov 7th, 2011 11:58 a.m.
Last week, we kicked off our annual Community Campaign with the announcement of a new program for Rhizome members called The Download. Through The Download, Rhizome members are invited to get a first look at a new and significant artwork by one artist every month. Artworks will come in a variety of ubiquitous file formats such as .gifs, .html, .mov, and .jpegs. All works will be delivered as a .zip via The Download page. Once the artwork is downloaded, it is yours to collect, share with friends, and display on the screen of any suitable device. The Download is a premier opportunity to become a collector of great digital art! For the first Download, we are highlighting a new work by conceptual artist Ryder Ripps (Internet Archaeology, dump.fm and OKFocus). Ryder Ripps's Facebook (2011) is a copy of his entire personal Facebook history including all of his photos, private messages, chats, and wall posts. The viewer is invited to explore all of Ripps's Facebook activity, exposing some of the most intimate and private information. As with previous works, this project confronts issues of privacy, Facebook, and fetishization of technology. Read more about Ripps's work on The Download page. Next month, we will feature a new work by video artist Sabrina Ratté including music by Roger Tellier-Craig, aka Le Révélateur. Look out for more information about upcoming featured artists in the next few months. The Download is supported by the Artist Fund, a pool of financial support generated by our members that is divided evenly among the participating artists. You can learn more about The Download and the Artist Fund on the FAQ page. If you would like to be able to receive The Download first-hand and directly support artists, please contribute to Rhizome's Community Campaign and the Artists Fund today!